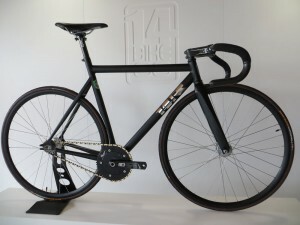 Appropriately enough for an event held inside London’s Olympic velodrome, there were many fixed-gear bikes on display at Bespoked. But while fixies have been a feature of city streets for years now, many of the Bespoked machines reflected a more recent trend in London and New York, a trend which suggests that their riders’ love of simplicity has morphed into something totally pure – or absolutely mad: no brakes. 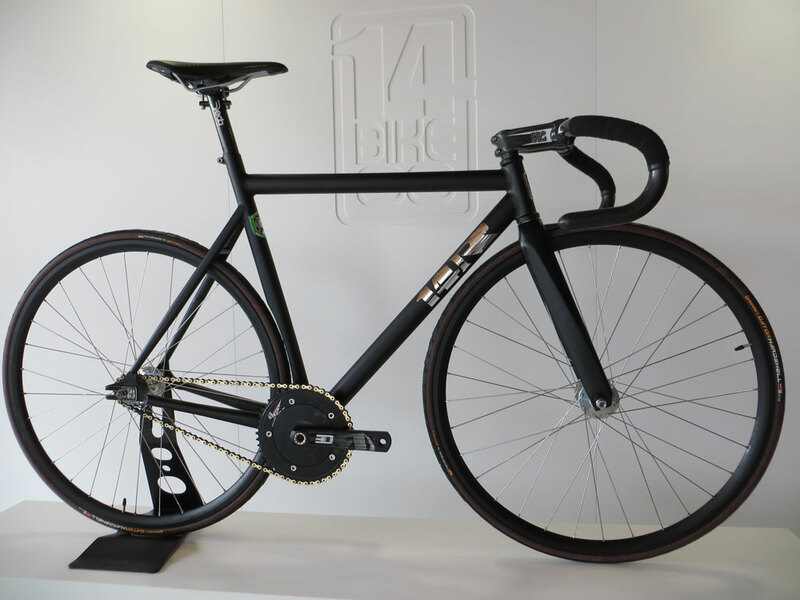 Showing off his razor-sharp machine by London fixed supplier 14 Bike was Mikey Ramirez, who rides for the Fixed Gear London “team”. This outfit garners plenty of press and, admirably enough, appears to exist only to promote the fixed-gear lifestyle. Ramirez certainly doesn’t articulate any particular commercial purpose for the team, but is very long on enthusiasm for the riding, and the “simplicity” of the bikes. London, he notes, is pretty flat – but his brakeless razor blade is good fun on hills, too; for speed control, he adds, it’s better to skid sideways than straight-on. 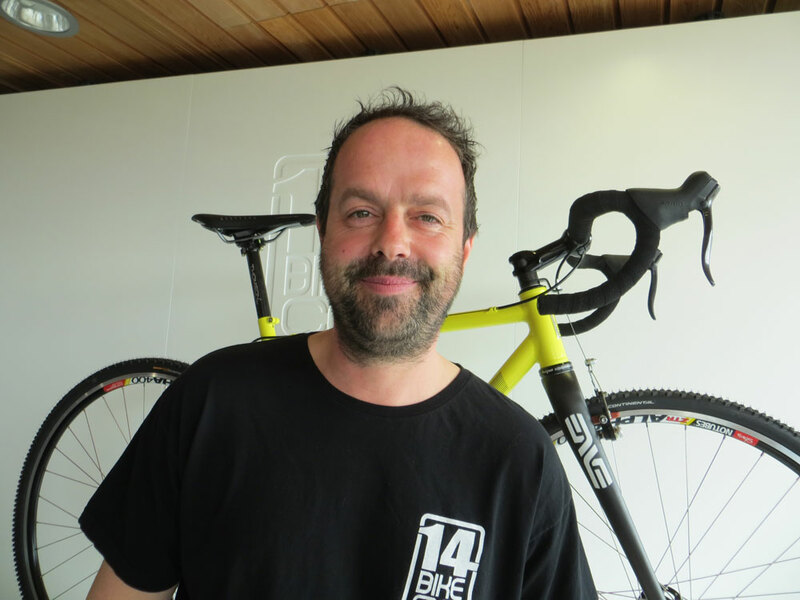 More commercially minded, 14 Bike proprietor John Wainwright observes that the “bike industry is feast or famine”, so he is changing the way he operates. As of Bespoked, this business overhaul was a work in progress – but the broad plan is to “scale up” what has been a fixed gear-focussed London shop making one-off custom bikes. First, Wainwright is ending one-off custom production in favour of building in batches “in the 20s”. Second, he is taking aim at two banes of a small bike producer’s existence: supply and distribution. 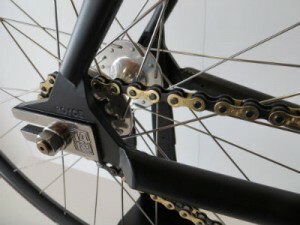 A partnership with an aerospace manufacturer that wants to get into bicycle components will hopefully provide 14 with a reliable supply of the parts it needs to make complete bikes (many of 14’s Bespoked show bikes featured cranks and hubs by Paul, which had to be shipped in at the last minute from the USA). 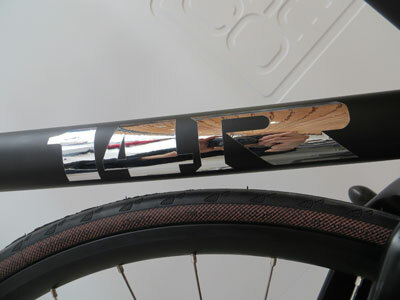 In turn, Wainwright will be the distributor for those components – presumably intending to do better than typical bicycle distributors, of whose service he despairs. Looking to be running with components by early 2015, Wainwright has at least temporarily dropped 14’s cycle clothing range, to focus his cash on building the new-look business. And cash, surely, is king. If any theme ran common to Bespoked exhibitors, it was that hand-building bicycles is not a road to riches. Any British taxpayer will know what Wainwright means when, asked to give an indication of the size of his business, he simply says he doesn’t pay income tax at 40%.